Astronaut, author, physicist, athlete, teacher, mentor, leader. Sally Ride was “just about everything you could ever imagine someone to be,” said UC San Diego Chancellor Pradeep K. Khosla. Chancellor Khosla was one of many who spoke of Ride’s accomplishments during the U.S. Postal Service’s May 23 stamp dedication ceremony honoring the first American woman in space. Hundreds of friends and family members—including the late astronaut’s mother and sister—as well as fans and former colleagues turned out to see the public dedication first-hand in the Price Center or tuned in to watch via the Postal Service’s livestream. Tam O’Shaughnessy, Ride’s life partner and co-founder of Sally Ride Science, speaks with the media before the dedication ceremony. 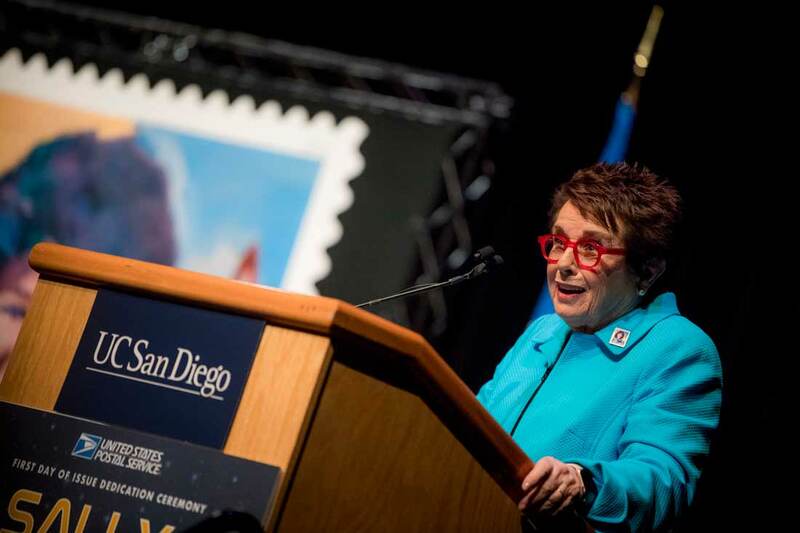 Ride, who was a member of UC San Diego’s physics faculty from 1989 until her death in 2012, was also an avid stamp collector, which made her commemoration on a Forever-denomination stamp all the more meaningful. The U.S. Postal Service’s stamp program recognizes extraordinary and enduring contributions to American society, history, culture or environment. Ride made history and captured the nation’s imagination when, blasting off aboard Space Shuttle Challenger in 1983, she became the first American woman—and at age 32, the youngest American—to go into space. Ellen Ochoa was one of those who was directly inspired by Ride’s accomplishment. The first Hispanic woman in space and outgoing director of NASA’s Johnson Space Center spoke at the ceremony about how Ride changed the course of her life and the lives of other female astronauts as well. The official first day of issue postmark for the U.S. 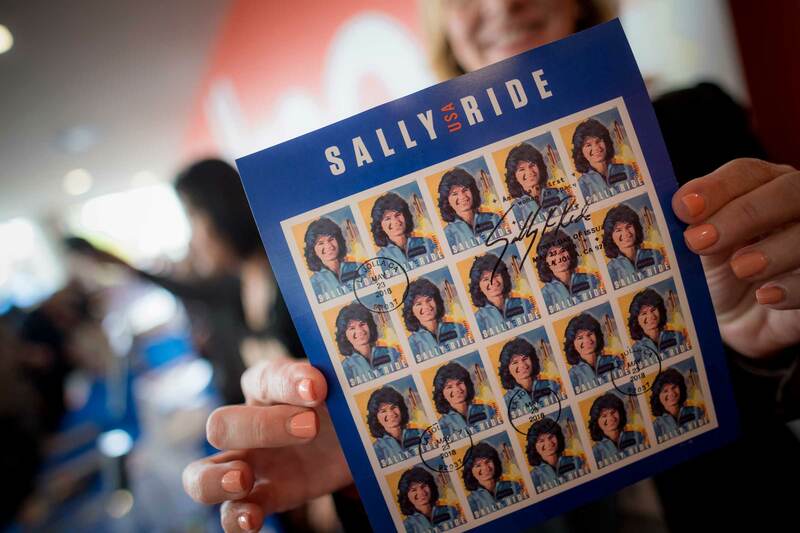 Postal Service’s Sally Ride stamps features a copy of the late astronaut’s signature. Tennis legend Billie Jean King also spoke at the dedication ceremony, recalling how the nation and the world celebrated Ride’s launch into space. King went on to talk about how Ride embraced science education, co-authoring books about science for children and co-founding Sally Ride Science with O’Shaughnessy to help bring science to life for young people. Now based at UC San Diego, Sally Ride Science has a mission to motivate young people to become literate in science, technology and math and to consider pursuing careers in these fields. “Tam found the perfect home for Sally Ride Science here at UC San Diego,” added King. Tennis legend Billie Jean King refers to Ride as a “shero” during the stamp dedication ceremony. 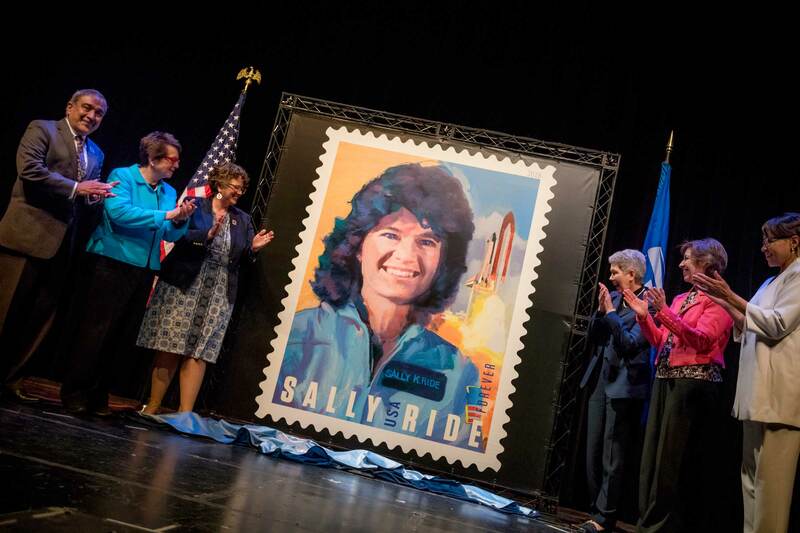 To celebrate the release of the U.S. postage stamp, Sally Ride Science at UC San Diego hosted a private, invitation-only event in the Price Center following the dedication ceremony. King and Ochoa joined Condoleezza Rice, 66th U.S. Secretary of State, for a conversation on Women in Leadership. Award-winning journalist and author Lynn Sherr, who wrote Ride’s biography, served as panel moderator. O’Shaughnessy said she came up with the idea for panel about a year ago when she began thinking about organizing an event around the USPS stamp ceremony. 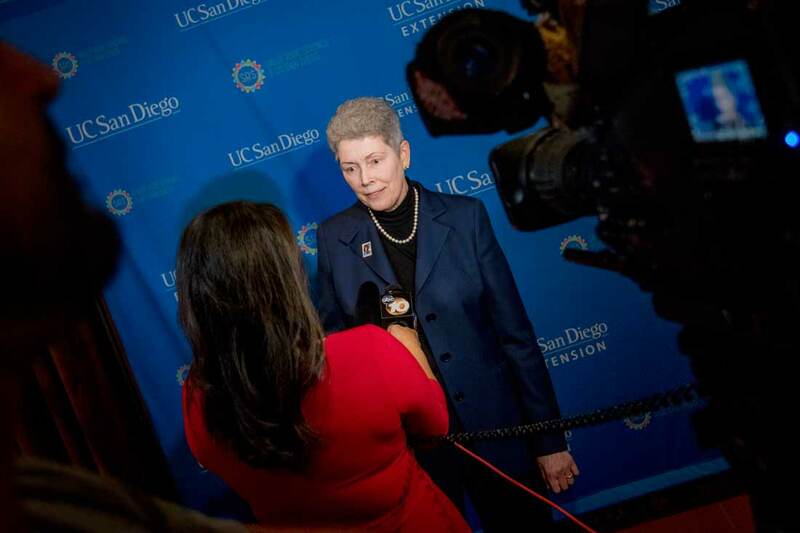 “I wanted to create something that was exciting and in sync with the mission of Sally Ride Science at UC San Diego,” said O’Shaughnessy, who serves as the organization’s executive director. “I came up with the idea of a panel discussion on Women in Leadership.” The event is planned as an annual celebration of outstanding women. She says she immediately thought of King, Rice and Ochoa for the inaugural event, and Sherr as moderator—all of whom were friends with her and Ride. And the conversation was everything expected, and more. Chancellor Khosla and UC San Diego Executive Vice Chancellor Elizabeth H. Simmons offered opening remarks before the panel launched into a lively discussion in front of nearly 850 guests that covered everything from how each of the women met Sally to what it means to be a trailblazing woman and the importance of role models and work/life balance. Among the many anecdotes and insights shared were some final thoughts on leadership. Ochoa emphasized the importance of taking care of your people. “One of your most important jobs in a leadership role is developing the people around you” because when you take care of people, only then will you be able to accomplish your mission. Following the stamp dedication ceremony, Billie Jean King and Ellen Ochoa joined Condoleezza Rice, 66th U.S. Secretary of State, (right) and journalist Lynn Sherr (second from left) for a panel discussion on Women in Leadership. “No one makes it on their own. Find good mentors and earn good mentors,” said Rice, who also stressed the importance of resilience. “I hope you take what you’ve heard here tonight and soar,” Sherr said in a final takeaway. The Women in Leadership event was made possible thanks, in part, to generous support from Red Door Interactive, Thermo Fisher Scientific and The San Diego Foundation. 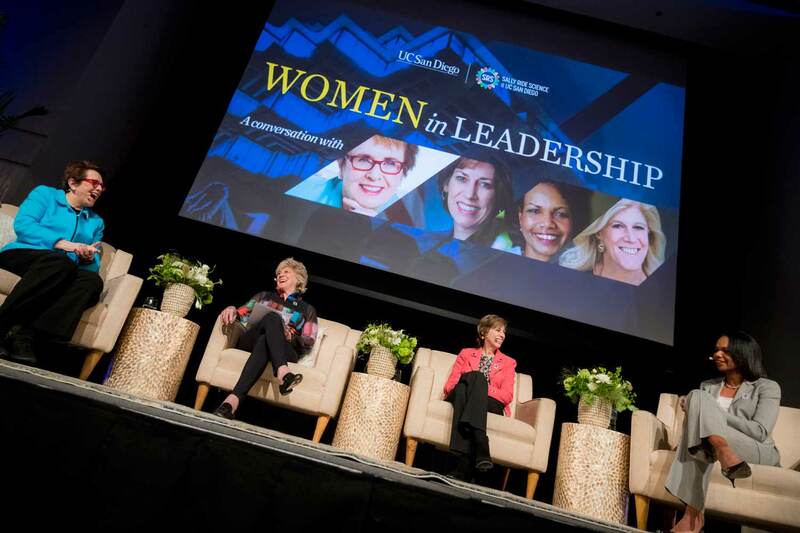 If you would like to watch the Women in Leadership panel discussion, UCSD-TV will air the program from June 4 through July 4, 2018.